Pen pals: 5 things mainstream comics can learn from the indies – AiPT! Let’s all, like, share the love and creative magic. I’m a man stuck in between sentiments. Like bringing condiments to a cookout. At 33, I’m old enough to remember a time when “he’s a clone!” was an acceptable storyline. (I chalk it up to the same shared ’90s delusion that made Day-Glo clothes and The Macarena popular.) I’ve seen first-hand the vast progression of comics writing since then, and how the works of Tom King and G. Willow Wilson and Matt Fraction and Marjorie Liu and countless others have evolved the scope and inherent value of the medium. But as someone who has reviewed more than his fair share of indie comics (Humanoids, Fantagraphics, Oni, etc. ), I see that there’s still work to be done by the Big Two. It’s not that titles like Dull Margaret or Kabul Disco are better, but these titles emanate from a vastly different creative start-point. A zone in which art and characters and dialogue exist to fulfill different reasons and overarching purposes (some might argue things more pure and essential). It’s that very approach that can provide lessons to enhance and expand more mainstream works, and allow the industry as a whole engage a whole new generation. Just so long as bare-face masks are still prohibited. Turns out, it’s not the size of the hero’s cape that matters most, but rather the dialogue. You know, that endless conversation between explosions, which builds story, defines characters, and sets the mood. Even as a firm lover of mainstream titles, it’s hard to get over the sheer heavy-handedness of some dialogue (I’ll once more point to almost any exchange in White Knight). To some extent, it’s understandable: these are meant to be hugely accessible, canon-spanning titles, books that dance atop a huge framework of history and context and still aim to tell the most engaging stories possible. But such flat, exposition-heavy dialogue only hurts the book’s impact. It’s the sort of thread that connects readers to the story, and without it all the action and intent are lost. The Solution: I’m really keen on the dialogue in writer/artist Kickily’s excellent Perdy. On the one hand, it totally feels appropriate to the intended era, with lots of mangled slang and heavy Southern accents plucked right from early 20th century America. More than that, every character’s dialogue feels a little different, and there’s a sense of nuance and texture based on their respective gender, morality, education, and even emotional baseline. It feels refreshing not because it’s a familiar tongue but because it helps to perpetuate the universe of the book and makes us play along with its many twists and turns. It’s a form of dialogue that requires work, and doesn’t just hand over plot or characterization. Bad dialogue is almost excusable; it’s sort of like watching an Arnold Schwarzenegger movie circa 1984 – it wouldn’t be the same without “Get to da choppa!” Yet a larger issue is that many comic writers can’t nail dialogue because they have problems crafting characters in the first place. 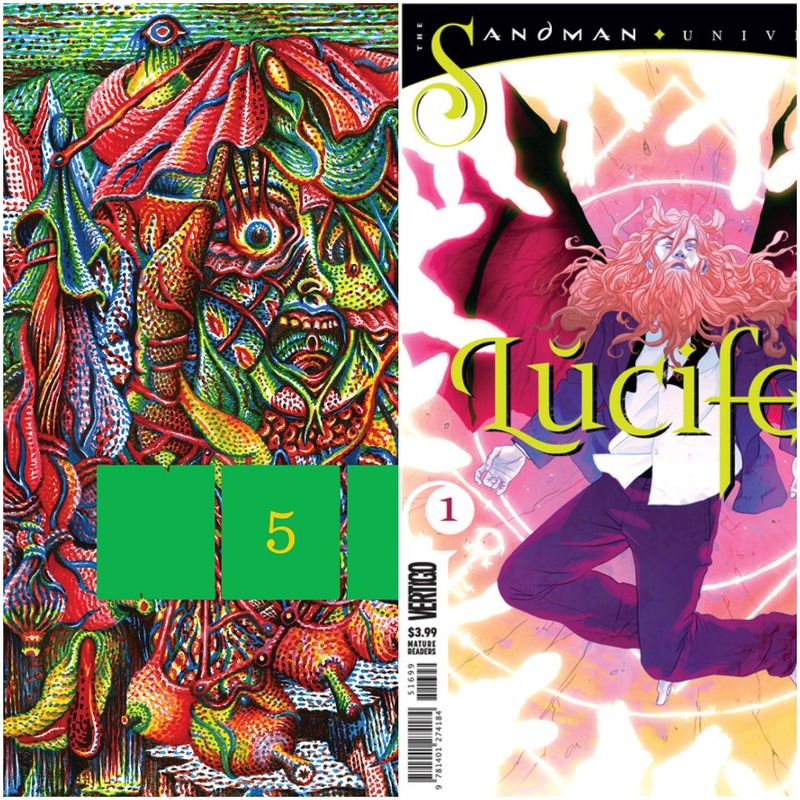 I generally enjoyed the issues of Lucifer I reviewed, but there’s one thread I never vibed with: Lucifer as less a character and more a literary device. As if everything he said and did was to perpetuate some part of the story or further some emotion or intention the author had in mind. That leaves him a little flat or 2D, and while it’s easy to understand him and support his end goals, it strips the character of potential. No longer do their struggles resonate with us on a deeper level, but we simply understand pain or anger or vengeance because that’s what we’ve been told. It’s like turning “The Screamer” into a paint-by-numbers. The Solution: Oni Press presented truly endearing characters in Long Road to Liquor City. It helps that writer Macon Blair is himself an actor/director, and as such understands the sort of language and emotions and motivations that make for organic, relatable characters. It’s also that the book doesn’t just hand you the character’s arc on a silver platter. You’re left to wonder who Thanny and Jed truly are, their backstory and their ultimate end-goals, and that makes for a level of engagement that almost forces the reader to care about what happens to these two. There’s some level of uncertainty that occurs, and that makes the reader’s brain do some detective work and fill in the gaps with their own dreams or ideas of the world. You ultimately give a hoot because of that effort, and the book is filled with other folks who make the world feel alive with genuine, buzzing personalities. It’s hard for me to disparage artwork. Because I don’t know how to do it (unlike writing), and that sense of mystery is inherently always exciting. But to paraphrase Justice Potter Stewart, I know good art when I see it, and that’s an important distinction. Mainstream comics are full of powerful artwork, with titillating action scenes and sweeping portraits, but so often I’m left feeling underwhelmed. As if these shots are lacking some kind of emotional connectivity. I’ll point to the recent Avengers Halloween Special. Lots of great artwork here – the “snikt!” shot is masterful – but so often the book (and so many others) feels predictable or busy emphasizing the same visual language. There’s even this tendency to repeat frame styles or perspectives. While no one deserves blame, there’s little denying that it makes for a slightly disappointing consistency and predictability that hurts whole books. The Solution: I will never, ever stop fanning out over the Now series. While Now and, say, X-Men are trying to achieve two vastly different goals, I can’t help but wonder what Now has to offer in terms of spirit if not technical approach. For one, there’s an influx of young talent, and while that’s not necessarily a problem for DC and Marvel titles, there’s always an issue of stratification and a problem of people breaking in. As an extension of that, the artists employed by Fantagraphics are given the reins to explore whatever ideas bubble to the surface. Now that’s not always possible given the corporate nature of the Big Two, but what is possible is a greater commitment to telling stories in one way and letting the art compliment in its own way. (Case in point: Some of BOOM’s WWE Attitude comics create a proper dynamic and distinction between the art and words.) It’s in the pursuit of this better balance that we achieve new ideas and understandings. Finally, Now is just plain weird, and that’s what more comics need an injection of. That oddball energy that shows us parts of the world we never thought existed. An unflinching desire to get as goofy and gritty as the story demands. Speaking of weirdness, there are plenty of big titles that would have you believe they’re strange AF when the truth is they’re far more tame. As much as I loved the book, I’d have to highlight Daughters of the Dragon as a book that traffics in this faux weirdness. Namely, this idea that if you slap a bunch of wacky things in a book (in this instance, Hydra attacking a putt-putt, or even some of the, admittedly great, banter between Wing and Knight), then that gives the entire book some kind of credibility. That it’s all these layers of influence and stacks of silly references that somehow makes a book worthwhile given how utterly insane it proves to be. Not only is that slightly untrue – weirdness doesn’t feel quite so simplistic, and requires something utterly shocking and mind-altering. But why is just such an attitude or approach coveted? Do books have to be weird to be worth reading, or is that covering up for other perceived shortcomings? If it’s going to get weird, it should be done in a way that feels organic and not just a rebellion against normalcy to develop forced street cred. The Solution: I mentioned Dull Margaret above, and while it wasn’t my all-time favorite, it does exemplify weirdness done right. Which is to say, it accomplishes a few key goals in the pursuit of perpetuating a specific mood and aesthetic. For one, the art work itself is deeply unsettling, which is only furthered by the characterization and the dialogue and the overall plot. But more than anything else, the weirdness of this book doesn’t insist upon itself. There’s no gore or grossness for the sake of showing off or trying to draw attention. It’s a weird book because that’s just how it is, something perfectly reflective of things utterly dark and intense within the actual world. That’s what makes a book feel truly important: it’s only doing what it was meant to, and if you react with disgust or boredom or some combination, then it’s done its job without resorting to drastic measures that harm a book’s value. There’s a really great story in the first volume of Grant Morrison’s JLA about psychedelic angels and the war for Heaven. It occurred to me that, for myself and so many others, part of that tale’s appeal is just how straight bonkers it is. That Morrison flings so much mythos and story bricks at the reader that it’s easy to be overwhelmed into submission. (It’s still a well written, awesome story, but it does still tend to stupefy even the savviest of fans.) There’s so many other tales like that in the comics universe. Out-of-this-world offerings that smack you in the face with their depth and absurdity. Yarns that span whole universes and timelines, and bury the reader in an avalanche of ideas and world-building and plots that are utterly awe-inspiring. Yet when you couple them with some of the aforementioned shortcomings – dialogue, characters, etc. – a truer picture emerges. This idea that maybe some stories have to be bigger than life because if you saw all the details all you’d notice are cracks and shoddy plaster. The Solution: Part of the problem is that stories need to be told that can stand on their own without all that story armor slapped on. Little ditties that strip away the magic and the wonder to given us something powerful and stirring. In this instance, something like Adrift comes to mind. There’s no lava monsters or over-complicated plots about zombie werewolves – it’s just a really interesting guy and his life of adventures. Because, in the end, that’s what people want: characters they can care about and follow as they smash themselves headlong into life, and the resulting pain and growth that follows. More big-time comics should be able to tear away all the shiny ephemera for something simple and effective. Once that’s in place, all the resulting sci-fi goodness and overwhelming colors will only enhance the experience. But it begins with something quaint and familiar, ideas and people we can cling to. That often begins with the most simplest stories possible – a person, a destination, and a goal to hold in their heart.